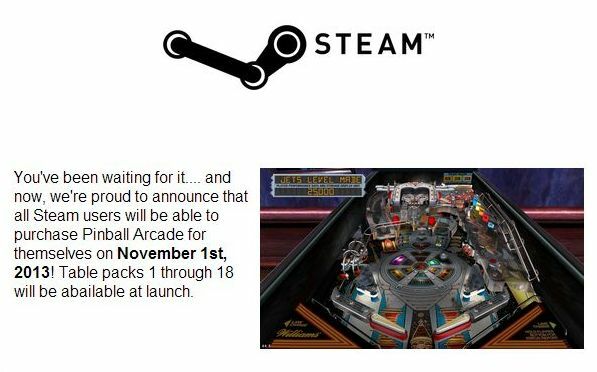 Pinball Arcade on Steam … but, not yet. Yesterday, November 1st I saw that picture and my heart went YAY that’s TODAY. But my wallet went NO, don’t search for it on Steam! Don’t do it! You already have TOO MANY FREAKING GAMES on Steam that you don’t play! So then, of course I started searching for it on Steam. It looks like the Steam launch is going to be delayed a few days. We thought everything was ready to go until we heard this morning that our in-app purchase prices weren’t set up correctly in currencies other than US dollars. The issue has been fixed, but now we’re awaiting clearance to release. We are very sorry for the inconvenience! My wallet then breathed a sigh of relief, but my heart went FFFFFUUUUUUU! We can’t even find out whether there is going to be some huge 18 table pack deal. There has to be. Right? RIGHT?! I am not a salesman but that type of deal just makes too much sense. UPDATE! Finally it is HERE! Say goodbye to your free time.